There are no prizes for guessing what this book is about. The title says it all: Snakes. And snakes are not something that the average British citizen has to worry about most of the time. In this story though, the inhabitants of a little village called Stainforth have plenty of reasons to worry about the slithering reptiles when a motorway pileup results in a truckload of snakes escaping into the countryside. The driver of the truck is their first victim, then the snakes move on to whoever is handy and when a young police constable called Mark Bazeley arrives on the scene of the accident and tries to administer first aid to an injured young lady—who, for some unexplained reason, is naked—he thinks that she must be delirious when she tells him that a snake has bitten her. Bazeley discovers the truth of her words soon enough though when he becomes the lunch of an African rock python. The snakes had been living in a zoo, but the zoo was forced to close and they were destined to be rehoused elsewhere. The zoo’s inventory of the snakes is a little suspect, but the authorities believe that they are searching for a pair of western diamondback rattlesnakes, one cobra, one African mamba, a pair of coral snakes, a Russell’s viper and, of course—the granddaddy of them all—the twenty foot long African rock python. To make matters worse it is an exceptionally warm summer; so the cold-blooded reptiles have every chance of surviving in the wild for quite some time. Extra police are called in to help look for the snakes and the military become involved, but an expert on snakes is also needed, so the authorities recruit the services of a young man named John Price. John has a degree in zoology and is an expert on poisonous snakes. Up until this point, John’s qualifications have only taken him as far as the dole queue, but you can’t have everything and, on the plus side, John’s elderly aunt lives in Stainforth so at least he has somewhere to stay. It is hard to say who is supposed to be the main character in Snakes, it is probably John Smith, but, like a lot of the other characters in the book, he only pops up for a few pages at a time then and disappears again while the story concentrates on someone else. The young gardener Keith Doyle is the viewpoint character just as often as John Smith (if often is the right word), and he is a character that it is easier to feel sympathetic towards. Like John, Keith has a good education, but when he couldn’t find a job he started his own gardening business rather than live at the taxpayer’s expense. Keith’s girlfriend’s parents don’t feel that Keith is good enough for her though, and—just to make it interesting—she thinks that she might be pregnant. I like Keith, and considered him to be the most believable character in the book, but, like the other characters, he’s not in the story often enough and I feel that Snakes could have been improved if a little more work had been put into defining the main character. Snakes is 170 pages long and for most of those pages the inhabitants of Stainforth are living in fear of the snakes. Nobody can find them, but the serpents keep on killing and that nasty old rock python seems to have developed a real taste for law and order because just days after it eats poor PC Bazeley it starts snacking on another policeman. It’s a real glutton too, so just a few hours later, it has another attack of the munchies, slithers into someone’s bed and has them for dessert. Please! I am not an expert on snakes, but I know a little about them and find it hard to believe that any snake could eat even one full-grown adult. But three of them in a matter of just a few days? And two of those in such quick succession? I don’t think so. This was just a little too far-fetched for my liking and it spoilt the book for me. 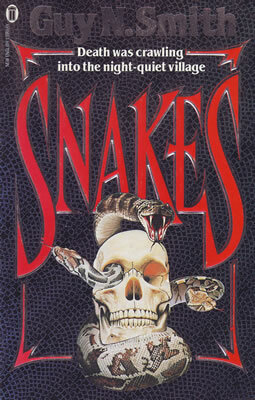 Other aspects of the snakes’ behavior were also hard for me to accept, so I cannot really say I enjoyed this book much. It’s okay, I suppose, but there are much better books on the shelves and Smith has written many better books himself. If you have never read any of them I would not recommend Snakes as a good one to start with, it might put you off reading any of his other work. Try Manitou Doll instead and then, if you want to, work your way down to Snakes.